Dynamic Australian insurtech, Evari Insure, has announced the establishment of a London office as it prepares to take its game-changing small business insurance product global. 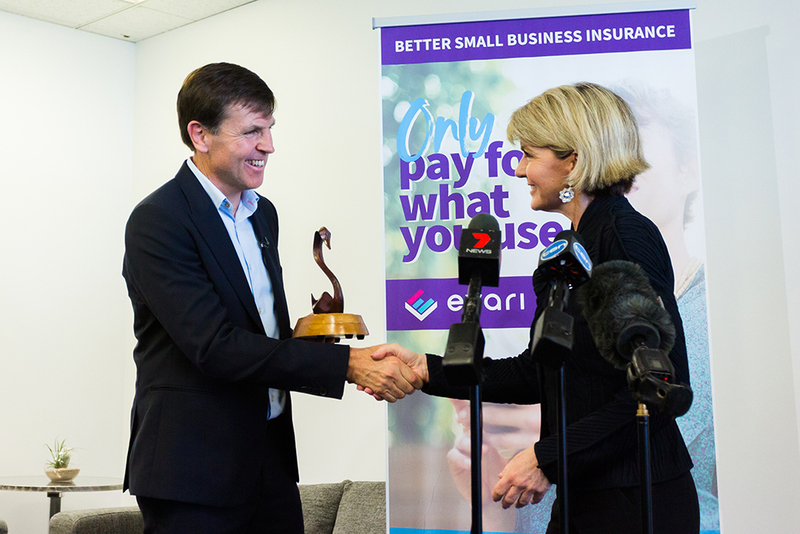 The international expansion into the world centre of insurance was announced today (Monday 27 August 2018) by the Member for Curtin, the Hon Julie Bishop MP, as she officially opened Evari Insure’s national headquarters in Perth. It’s another significant milestone for the company that in under two years has gone from the three founders working around a kitchen table to a 20 plus workforce, premises in the heart of the Perth CBD, a partnership with RAC Insurance and acknowledgement as one of MYOB’s fastest growing partners for 2018. There’s also strong international interest in the technology powering the cloud-based platform, offering fully digital, tailored small business insurance. Evari Insure’s CEO, Daniel Fogarty, said London would be the launching pad for the company to target UK, Europe and the US for future opportunities as well as acquiring leading talent. “The Australian and UK Governments are working together to encourage entrepreneurial business collaboration so we have been fortunate to benefit from programs and incentives that aim to leverage the fintech bridge between the two countries,” he said. “This support has been critical in enabling us to create local jobs and to showcase Australian innovation on the international stage,” he said. Mr Fogarty said Evari co-founder, Robert Jeffery, has moved from Perth to London this month to head up the London office and will focus on developing mutually beneficial partnerships. “This move is about taking Australian knowhow, and combining it with international expertise, to take our offering to a whole new level. Mr Fogarty said Evari was proud to have established its national headquarters in Perth, bucking the trend of businesses relocating to the bigger commercial markets of Sydney and Melbourne. For further details: Carla Shearman @ The PR Collaborative on 0418 140 220. •	Evari Insure was founded by Daniel Fogarty, Robert Jeffery and Brack Norris. •	With world-first tech enabled features, Evari Insure offers fully digital, tailored insurance for small business. 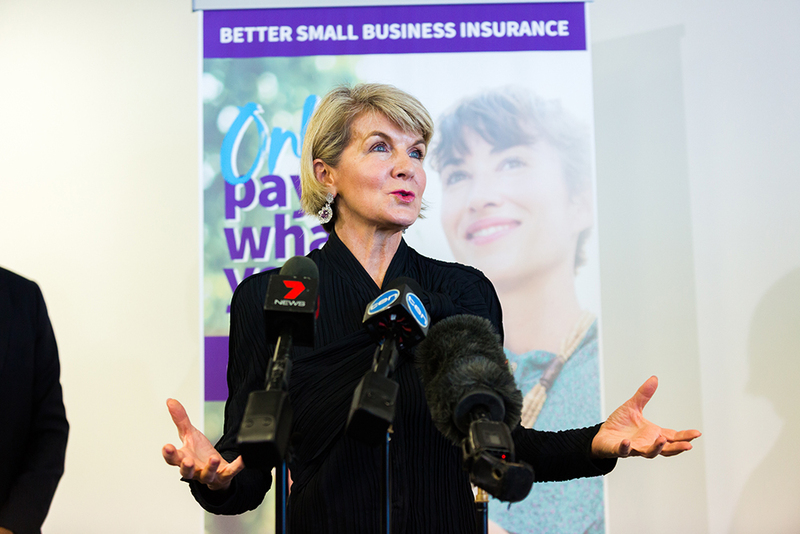 •	It allows tradies, café and restaurant owners, small retailers and professionals to adjust their insurance coverage to meet their fluctuating needs, all from their mobile phone. •	Evari Insure has traded traditional industry jargon and mountains of paperwork for simple policy wording and a user-friendly online experience. •	Evari is licensed by ASIC in Australia, is a Lloyd’s coverholder and its insurance products are underwritten by certain underwriters at Lloyd's. [From Left] Evari Founders, Robert Jeffery and Brack Norris, the Hon. Julie Bishop MP and Evari CEO Daniel Fogarty. The Hon. Julie Bishop MP offically opening Evari's national headquarters. We are a coverholder at Lloyd’s, which means your insurance is underwritten by certain underwriters at Lloyd’s, giving you peace of mind knowing your Evari policy is backed by some of the best.